Research a mutual fund's objectives to make sure it meets your financial goals. As of 2012, there are more than 7,000 mutual funds in the U.S., worth about $12 trillion, according to the Investment Company Institute. Choosing the appropriate fund to meet your investment goals can be daunting. As a matter of law, mutual funds are required to state their objectives in their prospectuses. 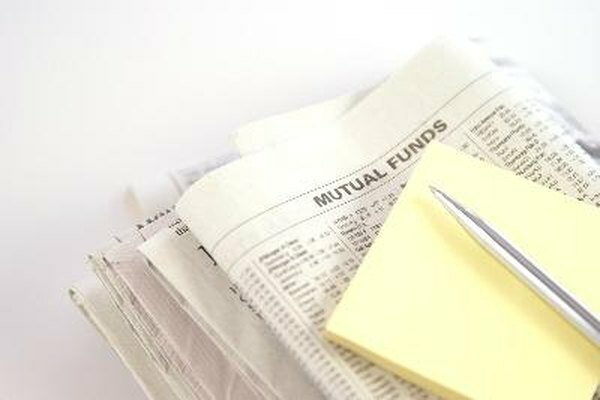 There are three basic types of mutual funds. Equity funds invest exclusively in stock. Fixed-income funds invest in bonds, and money market funds invest in Treasury bills and short-term, liquid, high-quality securities. All mutual funds are made up of one or more of these three asset classes. Funds are sometimes named, ostensibly, for their objective and have catchy names such as Global, International, Growth and Overseas. Evaluate the prospectus rather than drawing a conclusion from the fund's title. One consistent mantra of investing is diversification. Simply put, you should not place your entire investment in one company. Because mutual funds are based on the securities of many companies, buying shares in a fund automatically diversifies your portfolio. This might be an otherwise impossible task. Consider that one share of Apple Inc. trades for as much as $600, as of 2012. You might not have enough money available to adequately diversify. To select the funds in which to invest, a clear understanding of your investment goals is crucial. If you don't have clear investment objectives, you might as well choose your fund by throwing a dart or tossing a coin. If you are young with a healthy earnings future ahead, investment in a fund that is geared more toward growth than safety may be appealing. Alternatively, if you are approaching retirement, a more conservative fund such as a balanced income fund may suffice. If you are already enjoying your retirement, you might be a candidate for a money market fund, which offers little in the way of return but is extremely low in risk. Become acquainted with the securities in the fund you are considering. This will help ensure your comfort level. Mutual funds earn income from fees charged to account holders. Transaction fees are incurred each time you buy or sell shares. These fees are couched in the term "load." Then there are annual fees, which are akin to a membership fee and serve to pay operating expenses. Taken as a whole, these fees can range from 0.2 percent to as much as 2 percent. The average fees are 1.3 percent to 1.5 percent. If you are in a specialty or global fund, you will likely pay more because they require managers with a higher level of expertise. You don't need to break out the calculator to see how these fees can be a drag on your return. High fees do not guarantee superior performance. Select your mutual fund on the basis of its track record and don't be lulled into thinking a high fee will guarantee exceptional performance, as there usually is no correlation. Personal Finance; E. Thomas Garman, et al.